PRICE INCLUDES VAT UNLIKE MANY OTHER SELLERS. CLAIM BACK VAT FOR YOUR BUSINESS. WE WILL SELL THIS DISPLAY ONLY TO PROFESSIONAL INSTALLERS, EXAMPLE SHOPS.. THIS DISPLAY REQUIRES THE TECHNICIAN TO BE CAREFUL OR IT WILL BE BROKEN. WE CAN INSTALL THIS DISPLAY 100% BRAND NEW SAMSUNG S7 Galaxy Edge SM-G935F G935F AMOLED ORIGINAL GENUINE COMPLETE FULL OEM LCD SCREEN DISPLAY TOUCH PAD TOUCH SENSOR TOUCH SCREEN DIGITIZER TOUCH PANEL. INCLUDES THE LENSE LENS GLASS FRONT. 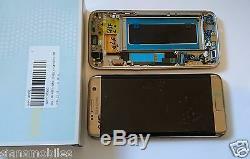 GOLD COLOUR SAMSUNG PART NUMBER: GH97-18533C THIS IS NOT A TELEPHONE! Vendiamo solo prodotti originali garantiti all 100%. Con spedizione diretta in italia 7 giorni su 7. ATENÇÃO: CLIENTES América do Sul, sempre fazemos ITENS NO VALOR MAIS BAIXO / (nota fiscal) para que você não pague impostos aduaneiros quando receber o produto. Atencion: Clientes sudamericanos, voy a enviar los paquetes con un costo de factura bajo, para que no pagen mucho impuesto al recibir el producto. THESE ARE TESTED FULLY AND CAREFULLY IN DETAIL UNLIKE OTHER SELLERS. ALL OF OUR ITEMS IN A VERY STRONG BOX ALONG WITH OTHER PACKAGING. TO ENSURE THE ITEM YOU RECEIVE IS 100% PERFECT NOT BROKEN. THIS IS A TRIED AND TESTED METHOD WITH 1000S OF ITEMS SENT WITHOUT 1 BREAKAGE. VERY HOT PRODUCT HARD TO GET HOLD OF. ORIGINAL MOBILE PARTS ARE HARD TO FIND, A LOT OF TIME GOES INTO GETTING THESE. SOME SELLERS OFFER "TOOLS" FREE. WHAT THEY INCLUDE IS A BIT OF PLASTIC OR A CHEAP VERY LOW QUALITY SCREWDRIVER WHICH DAMAGES THE SCREWS. ALSO TOOLS CAN DAMAGE YOUR ITEM IN THE POST WHEN PUT IN THE BOX TOGETHER. THIS IS WHY WE ALWAYS SAY MOST ITEMS CAN BE INSTALLED USING YOUR OWN TOOLS AT HOME NORMAL SCREWDRIVER ETC. ALL OUR ITEMS DO NOT REQUIRE SPECIALIST TOOLS, THERE IS NO SOLDERING INVOLVED ETC. IT'S BEST TO USE YOUR OWN NORMAL QUALITY SCREWDRIVER IF 1 IS NEEDED, OR WE WILL TELL YOU WHERE TO FIND A VERY CHEAP GOOD QUALITY 1. WE ARE EXPERTS IN THIS. DON'T TAKE OUR WORD FOR IT JUST HIT THE FEEDBACK BUTTON ABOVE AND SEE FOR YOURSELF. THE COPIES ARE USUALLY FROM SELLERS ABROAD SUCH AS HONG KONG, CHINA SINGAPORE ETC AND SOME OF BIG SELLERS ON HERE IMPORTING LOW GRADE COPY ITEMS. ALL DISPLAYS SENT IN THE UK ARE SENT SAME DAY WITH TRACKING CODE. Thanks for taking your time to look! The item "SAMSUNG GALAXY S7 EDGE G935F LCD TOUCH SCREEN DISPLAY ORIGINAL GENUINE GOLD UK" is in sale since Thursday, April 7, 2016. This item is in the category "Mobile Phones & Communication\Mobile Phone Parts". The seller is "siansmobiles" and is located in West Yorkshire. This item can be shipped worldwide.